Oh yes I did! You thought it would never happen. It did! Don’t wait, just bake! 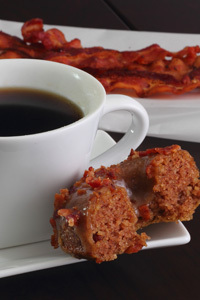 If you’re not paleo, a gluten-free maple and bacon donut might seem a bit bizarre. Just think of it this way: pancakes, maple syrup and bacon. All breakfast flavors you love, right? Well here they are together in one glorious glazed donut! But here’s the deal. We’re not allowed to have a lot of sweets on the paleo plan. That’s just how it goes. But if you’re like me and my hubby, we’ve stuck pretty close to the paleo rulebook for awhile – going on 8 months now. We believe we’re entitled to a little treat every now and then. If you think you deserve a reward too – something you’ll really love and don’t have to feel too guilty about – well congratulations, you’ve earned this. Or maybe you’re not paleo at all, and just want to enjoy treats that are gluten-free and contain no processed sugars. Well congrats to you too, you’ve hit the jackpot with this recipe! No deep-fat fryer required. Just mix and bake in a cheap donut pan. Obviously, this is not breakfast people. It’s a dessert. Enjoy a nutritious breakfast, and have one of these savory treats on the side. So here’s a little backstory on the donuts… I lived in the Northwest for a long time. If you’re a northwesterner too, you’ve probably heard of VooDoo Doughnuts in Portland, Oregon. They serve crazy, awesome donuts! In fact they’re so good, the minute they open the doors to their hole-in-the-wall on 3rd Avenue, a line forms around the block. Make these and your friends could start queuing up at your kitchen like Voodoo Doughnuts in Portland! One of their bestsellers is a maple bar with bacon. Seriously? What could be better than that? So that’s where I got my inspiration. I wanted to make a paleo version of VooDoo’s popular treat. I admit I stepped outside the box with this one. I can honestly say, I love it. What’s special about these donuts? There are actually little bits of bacon inside the donut. You take a bite, taste the sweet cake along with a little salty-smokey flavor from the bacon. Oh my goodness…I think you’ll go hog-wild over these. And if that wasn’t enough, I used a little more bacon as sprinkles on top the sweet maple glaze! Boom! There you have it! 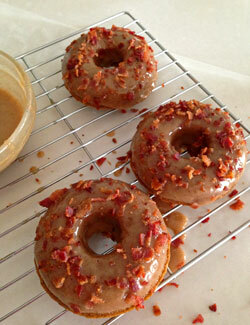 The perfect paleo maple bacon donut…completely gluten and refined sugar free! That’s it. I have nothing left to say. I’ll let the donuts speak for themselves. Get a large Ziplock bag and pour the batter into it. Release the air and seal the bag. Dip one side of the donuts in the glaze and return to the wire rack. 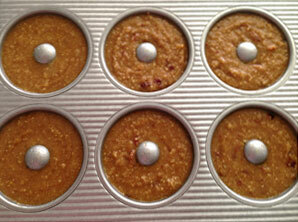 I made these as muffins, and they were amazing!!!! Thanks for the recipe. Diane, at this time i do not add nutrtional valuse to my recipes. If you’re interested, there are websites available where you can add the ingredients and amounts and it will do it for you. These sound amazing!! I know what I am baking this evening. Thank you so much for sharing!! Can you add sorghum flour instead of almond flour? Veronica, I haven’t made them with sorghum flour, so I,don’t know. Sorry. I’ve been to Voodoo Doughnuts a few times (on trips to see the in-laws). My favorite thing is the maple bacon bar. Thank you for this! I have been gluten free for quite some time and have missed doughnuts! And these in particular! Can’t wait to try baking them!